Originally published under the title "The West Lies Down Before Saudi Lies." Saudi Foreign Minister Adel Al-Jubeir: "ISIS is as much Islamic as the KKK is Christian." Saudi Arabia—the world's greatest hypocrite—is at it again. On February 12, 2016, the Munich Security Conference (MSC) was held. It's described as "the world's largest gathering of its kind"; "the most important independent forum for the exchange of views by international security policy decision-makers," where "about 350 senior figures from more than 70 countries around the world to engage in an intensive debate on current and future security challenges." It's apparently also where lying about one of the "current and future security challenges"—Islamic terrorism—goes unchallenged. 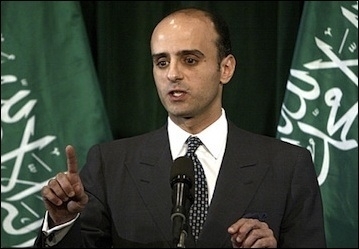 Enter Adel al-Jubeir, Saudi Arabia's foreign affairs minister. This representative of the one nation that has done more than any other to spread radical Islamic ideology spun lie after lie during his 20 minute presentation (transcript) before a captive audience. Daesh [Arabic acronym for ISIS] is a terrorist organization composed of psychopaths who have no religion and no morals. They attract other psychopaths and it's a cult. And it will be defeated. But in order to defeat Daesh, we have to deal with what I call the two elephants in the room. One of those elephants is Bashar al Assad. We cannot defeat Daesh in Syria unless we bring about change in Bashar al-Assad. He is the man who helped create it by releasing radicals from his jails, by allowing Daesh to operate without attacking them, by even trading with them. He is the man that allowed them to become what they are. So the Saudi minister of propaganda would have the world believe that the secular, non-Sunni, Assad is the man who "created" and empowers ISIS—a radical Sunni jihadi group born and bred on Saudi Islamic indoctrination and dedicated to overthrowing none other than Assad himself. Jubeir would have the world believe that non-Sunnis are responsible for the rise of ISIS. Jubeir concluded his Assad rant with a barely veiled threat: "unless and until there is a change in Syria, Daesh [ISIS] will not be defeated in Syria. Period.... When Assad goes, the fertile environment in which Daesh operates in Syria will be removed and we can deal with them." When one appreciates how intricately connected Saudi Arabia and ISIS are, this sounds more like, "we will not reign in our mad jihadi dogs until we get our way." Every religion has perverts and psychopaths who try to hijack it. ISIS is as much Islamic as the KKK is Christian. Don't they have a cross? Don't they do everything in the name of religion and Christ? Don't they believe that Christ compels them to lynch and kill people of African descent? ...For anyone to argue that DAESH is Islamic is preposterous. In short, the Koran does support the actions of ISIS—not to mention the actions of Boko Haram, the Taliban, al-Qaeda, Hamas, Al Shabaab, and 41 Muslim nations that make the lives of Christian minorities a living hell. That's why a PEW poll found that at least 63 million and as many as 287 million Muslims in just 11 countries—and 81% of Arabic language Al Jazeera respondents—support what Jubeir dismisses as "psychopaths who have no religion and no morals." Jubeir didn't bother telling his audience that mainstream Islamic jurisprudence holds that Koran 109:6 and the few other tolerant verses have been abrogated by more "final" verses that call for eternal violence against all who reject Islam, such as Koran 9:5 and 9:29, the notorious "sword verses." Where, O Jubeir, is all this Islamic "tolerance and acceptance" you gush about? Why is a nation that behaves like ISIS allowed to speak at a Western security conference? The real question isn't whether ISIS is Islamic; only fools and clowns are still trying to figure that one out. The real question is why a nation that behaves like ISIS is allowed to speak at a conference dedicated to "intensive debate on current and future security challenges," and then given free rein to spew lie after lie? From here, one begins to understand that Saudi Arabia and its premiere role in exporting "extremism" around the world is only one part of a more complex problem.